If you have ever been to Spain and wondered what type of coffee, or café as it’s known locally, to ask for then this guide to ordering coffee that I came across recently is just for you. Spanish coffee is strong and down to earth. You won’t find a menu with lattes or cappuccinos. So, whether you choose to drink it hot, with ice, decaf, with or without milk or very sweet with condensed milk, this guide will hep you decipher the lingo when it comes to ordering coffee in Spain. If you prefer not to drink caffeine, you can order all the coffees in the guide with decaf coffee (descafeinado). So, a decaf coffee with condensed milk becomes ‘un descafeinado bombon’. While the guide refers to a café manchado as either an espresso with a splash of milk or a ‘glass of milk flavoured with coffee’, I have always known it as the latter – hot milk with a splash of coffee. Coffees do vary from region to region though, so it’s worth checking. If you are visiting Spain in summer, a café bombon con hielo (coffee with condensed milk and ice) is a great way to drink something cool if you don’t fancy an ice cream or would prefer a cool, but sweet alternative to a dessert after a meal. One thing that is still not common everywhere in Spain (although Madrid may be different) is soy or other alternatives to dairy milk. However, lactose-free milk is generally on offer in most coffee shops, restaurants and bars. 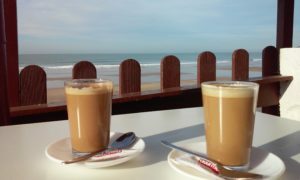 Don’t be surprised if your coffee served in a glass in Spain, but one thing you will rarely find (and let’s hope it stays that way) is coffee served in a plastic or polystyrene disposable cup therefore, making coffee drinking an environmentally-friendly affair as well as a sociable one. As the guide to ordering coffee says “the last thing to note is that most Spaniards do not take their coffees ‘to go’. Instead, they sit down to enjoy their drinks with friends or family”.